Cory arranged to have both families at the ranch for a horseback ride proposal. To make sure Katie wouldn’t get suspicious, he told her that it would be a good opportunity for both families to get to know each other and “spend some quality time getting to know each other.” It worked! With the help of Tim and Lee Swanson – cousins of Cory, a sunset(ish) horseback ride was scheduled. With friends and family present, the engagement ride was set for August 4 th . That morning and afternoon Cory was such a wreck he couldn’t sit still. He must have watered the front lawn until it was completely saturated and paced about 12 miles! The time for the ride finally came and so Cory went to grab the ring, still in the bulky box. He tucked it in the back of his shirt, above the Wrangler jeans and headed down to help saddle the horses. Doing his absolute best to avoid Katie at all costs, she smelled blood and came up to him for a hug. Cory successfully, yet extremely awkwardly pulled off a pirouette out of the hug and somehow casually walked away. Crisis averted! We got on the horses, and, as customary, passed around the Jameson bottle for one last swig. Cory took about six…! Everyone but Katie was aware of Cory’s proposal intentions, so with friends and family waiting at the lake and armed with champagne and cameras, the riders took off on horseback. Katie’s whole family saddled up with us. Strolling up to the lake, nervous as can be, Cory got off his horse to sneak up on Katie and ask her to marry him. Small issue – she casually rode her horse, Starbuck, into the lake and two feet of water! Juuuust perfect…! 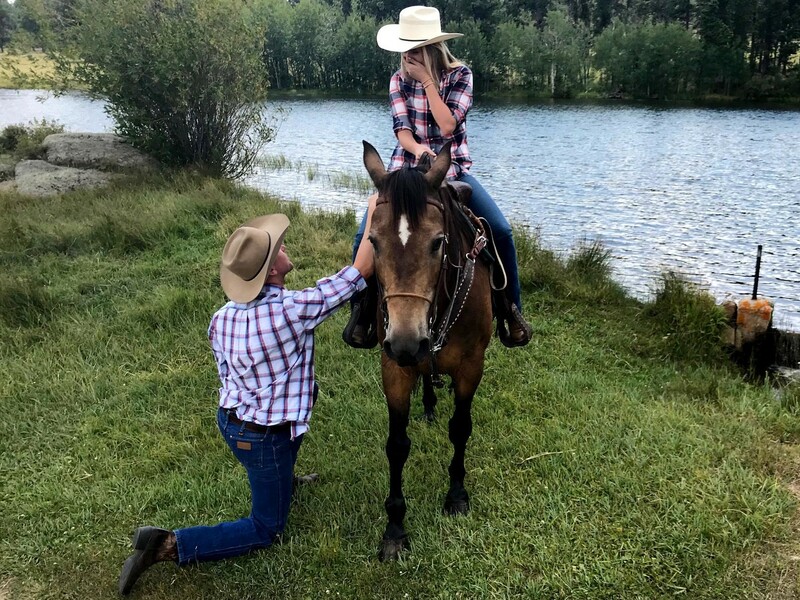 Unable to get on a knee with her horse in the lake, Cory faltered like a bozo, full of Jameson and no idea what to do. Thankfully, Lee called Katie to get her horse out of the water. Cory quickly snuck up to Katie’s right and took a knee. Completely unsuspecting, Katie had the “oh my God” soundbite on repeat. It took about two minutes until Cory actually got his confirmation. With everyone there and Cory finally able to breathe, we were able to enjoy the moment with friends, family, toasts of champagne and the spectacular scenery afforded by the ranch. It was a special moment and we wouldn’t want to change a second of it! !